Many of you know how much I love my Roasted Italian Tomatoes recipe. I’ve made it into soup as well as designing a Sweet Potato Soup with the same concept. 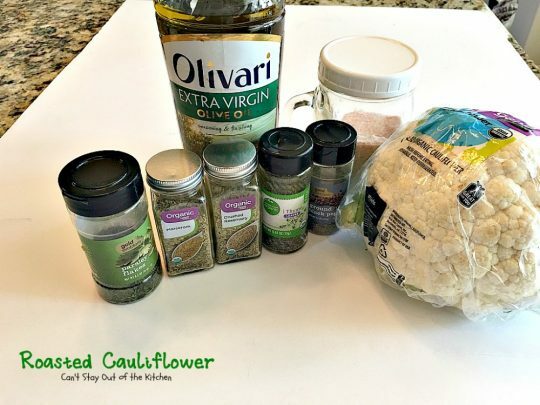 I thought that same seasoning idea would work well with cauliflower and it really does. My Roasted Cauliflower Garlic Soup is wonderful. 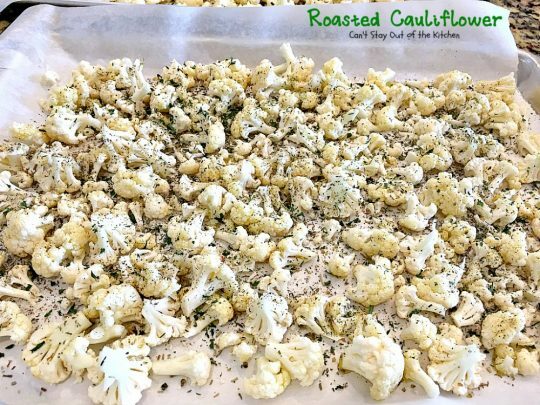 So I thought, why not just Roasted Cauliflower? Yes, yes, and yes! The last weekend in January our church was hosting a Disciple Now Weekend for the youth. I signed up to make meals for a friend of mine who was hosting freshman high school girls. I rolled out my new and improved version of Pesto Chicken Stuffed Shells with substantially amped up seasonings which they absolutely loved. I served it with Creamy Grape Salad which I make literally ALL the time — almost every time I take a meal to someone. It’s so easy to make and everyone always drools over it. I also made some Nutella Peanut Butter Swirl Bars for dessert, and served this veggie as a side dish. I wasn’t really sure if the girls would go for it or eat anything this healthy. But I was pleasantly surprised as they loved it and the host parents just raved over this dish. In fact, I got a text message shortly after they had dinner that they wanted the recipe! Last weekend they told me they even went to the store to purchase marjoram (one of the herbs in this dish), because they liked it so much and wanted to make it. I recommend you do the same thing. Marjoram adds such incredible flavor to casseroles, side dishes, soups and even homemade breads. I even like it in pot pie! 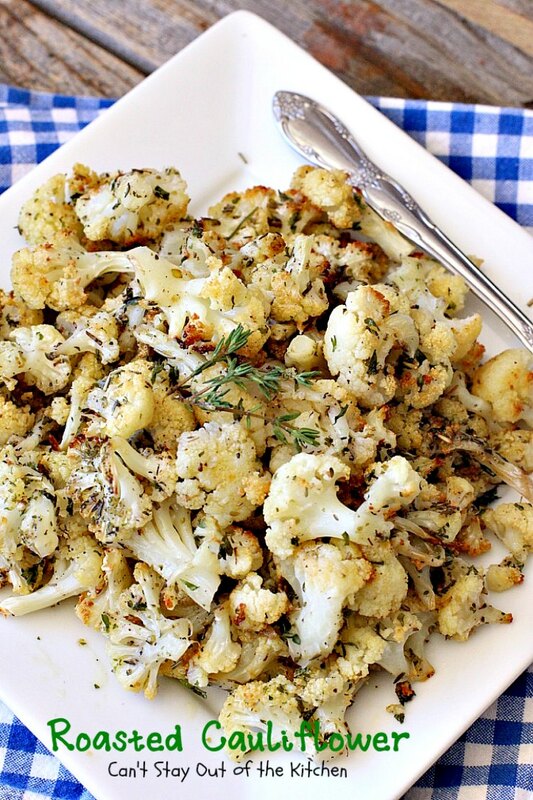 Roasted Cauliflower is super simple to make. I broke up the florets and put them on a parchment-lined cookie sheet. Then I dabbed olive oil lightly on each piece before sprinkling the seasonings evenly over top. Really, it can’t get much easier. 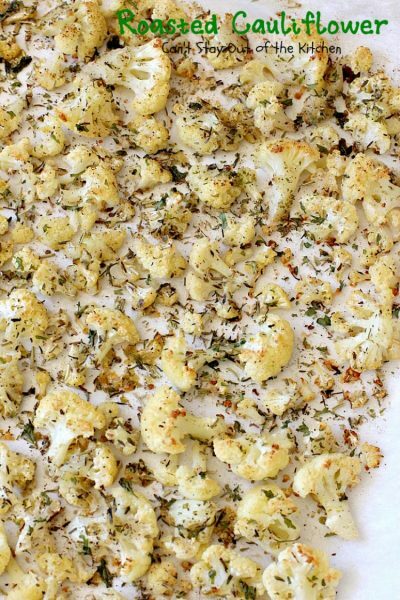 You end up with a superb side dish that’s incredibly LOW in calories and one you’ll enjoy eating all the time….even for snacks! 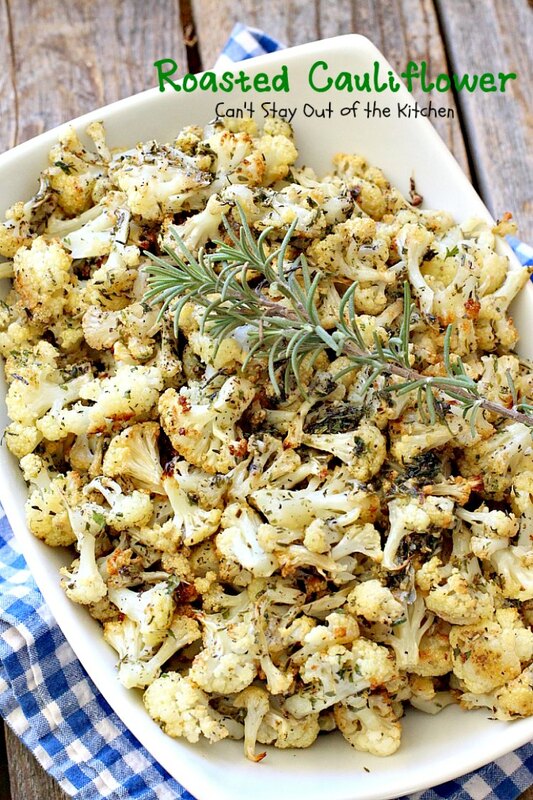 Roasted Cauliflower is sensational. It’s a delicious side dish for any entree. This close up shows the texture of the dish. The seasonings make this really extraordinary. Every bite of Roasted Cauliflower will have you coming back for more! I used these ingredients. I actually made two batches of this so two heads of cauliflower. The mason jar contains pink Himalayan sea salt. 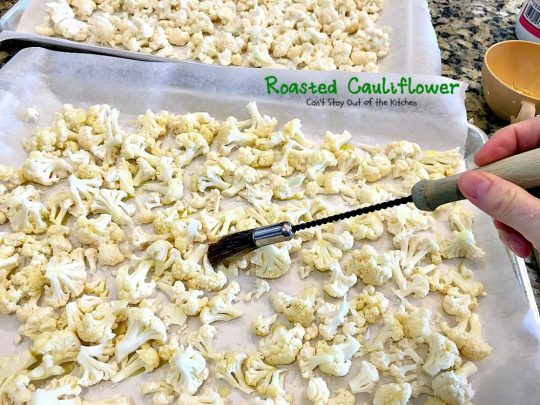 Break cauliflower up into florets. Discard stalk. 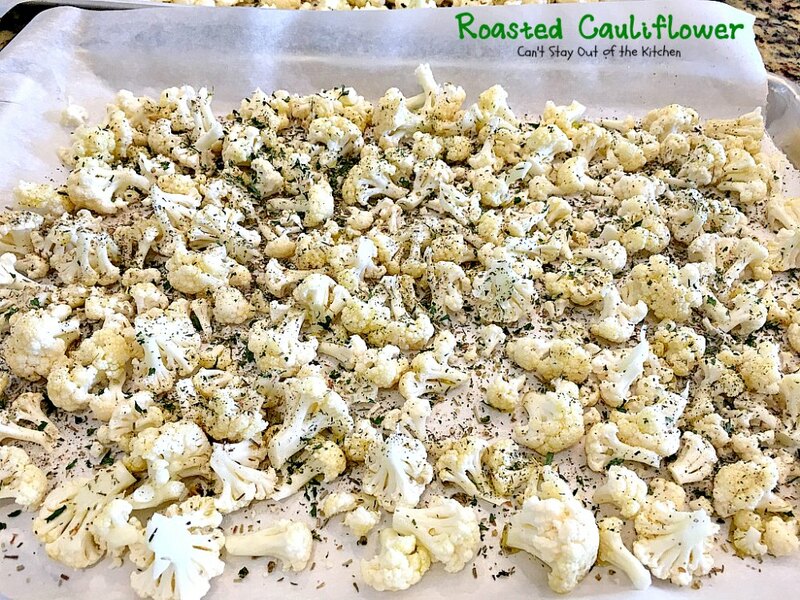 Place cauliflower florets on parchment paper-lined cookie sheet. Dap a little bit of olive oil on each floret, if possible. Sprinkle seasonings evenly over top of cauliflower. Bake at 400 degrees for about 45 minutes until cauliflower is tender and lightly golden brown. Garnish Roasted Cauliflower with additional fresh thyme, if desired. This is an excellent choice as a side dish when company’s coming. They’ll love it! This fabulous side dish is the perfect accompaniment to almost any main dish entree. Great for the holidays too, when you want lighter fare. Healthy, low calorie, clean eating, gluten free & vegan. Break off florets from stalk. Place on parchment paper-lined cookie sheet. 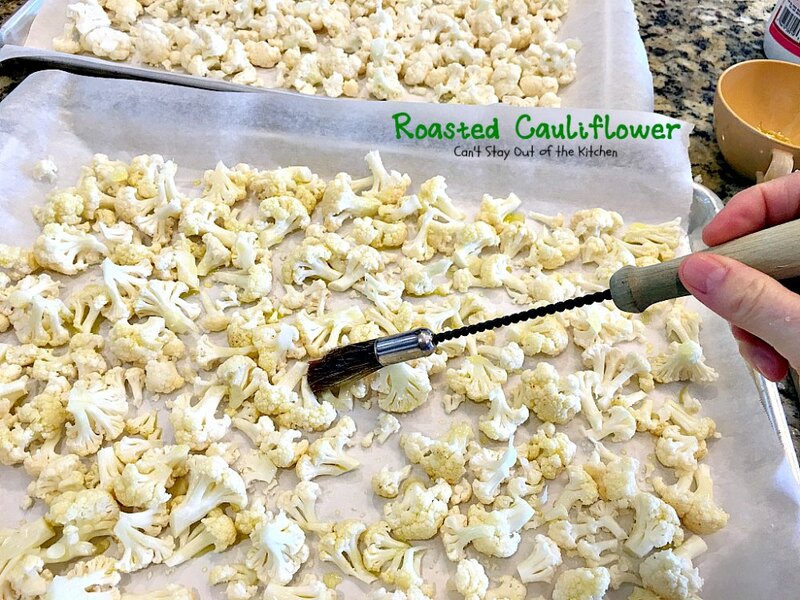 Dab olive oil evenly on cauliflower florets, trying to get a little bit on each floret. Roast at 400° about 45 minutes or until veggies are tender. NOTE: If you choose to use fresh herbs, you will probably need 1 to 2 tablespoons of each. 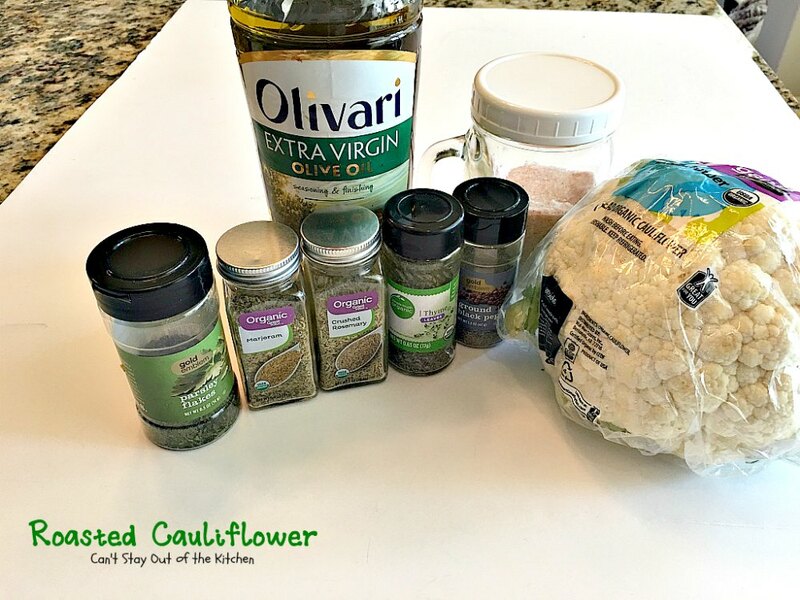 Roasted Cauliflower is a great side dish to make for the holidays especially if you are looking for something a little lower calorie. 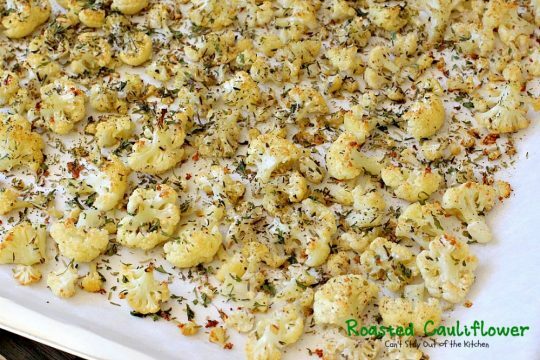 We loved the savory flavors of this side dish. 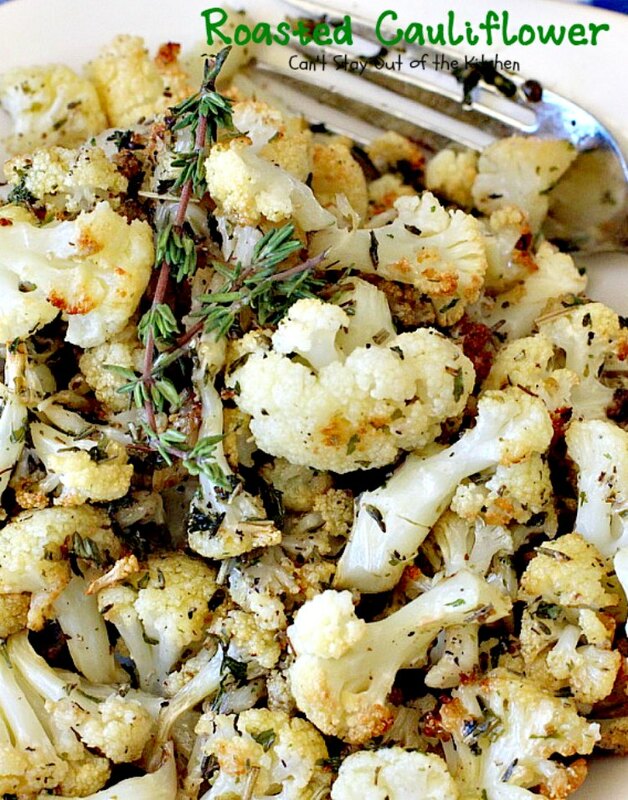 If you enjoy cauliflower, this is a heavenly way to use it up. 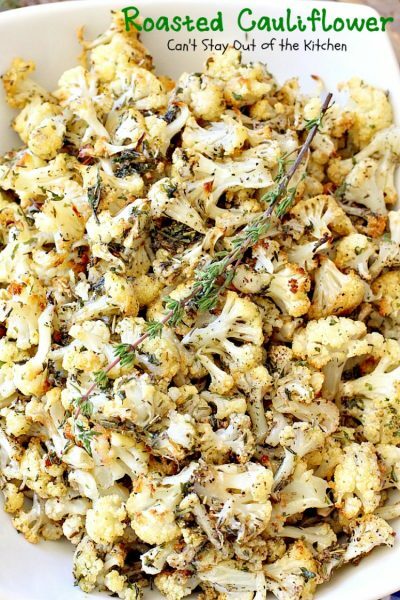 If you’re looking for healthy, low calorie, gluten free and vegan side dishes, this recipe fits the bill! Delicious! I am the only one in my family who eats cauliflower, so will try to get my hubby to eat it roasted. Thanks, Joanne, hope your hubby enjoys it. It’s really terrific. Hi, Dan. 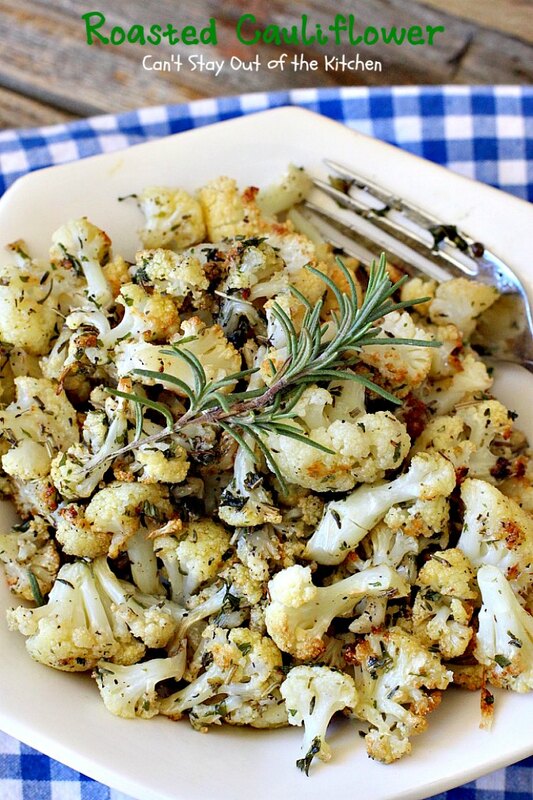 This easy recipe really is terrific and a great way to eat cauliflower. Hope you give it a try.